Two freelancers who are always happy to find good people to work with. Good relations with our clients is very important to us! Observado o disposto no parágrafo abaixo, no caso de indisponibilidade temporária da Taxa DI quando do pagamento de qualquer obrigação pecuniária prevista nesta Nota Comercial, será utilizada, em sua substituição, para apuração de "TDIk", a última Taxa DI divulgada oficialmente, até a data do cálculo, não sendo devidas quaisquer compensações entre a Emissora e o titular desta Nota Comercial quando da divulgação posterior da Taxa DI que seria aplicável. Caso a Taxa DI deixe de ser divulgada por prazo superior a 10 (dez) dias, ou caso seja extinta ou haja a impossibilidade ou limitação legal de aplicação da Taxa DI a esta Nota Comercial, será aplicada no lugar da Taxa DI, automaticamente, o parâmetro legal que vier a ser determinado, se houver. Caso não haja uma taxa substituta para a Taxa DI, será utilizada então a taxa média ponderada de remuneração dos títulos públicos federais brasileiros de curto prazo, à época de tal verificação, que tiverem sido negociados nos últimos 30 (trinta) dias, com prazo de vencimento de 180 (cento e oitenta) dias. Subject to the provisions of paragraph below, in the case of temporary unavailability of the DI Rate, upon payment of any monetary obligation provided for in this Commercial Note, the last DI Rate officially released will be used in its place for calculation of "TDIk", until the date of the calculation, no compensation being due between the Issuer and the holder of this Commercial Note according to the posterior publication of the DI Rate that would be applicable. If the DI rate is no longer published for period of more than 10 (ten) days, or if it is abolished, or there is the impossibility or legal limitation of the application of the DI Rate to this Commercial Note, the legal parameter that may be given, if any, will be applied instead of the DI rate, automatically. If there is no substitute for the DI Rate, then the weighted average rate of return on short-term Brazilian government securities will be used, at the time of such assessment, which have been negotiated within the last 30 (thirty) days and maturing in 180 (one hundred and eighty) days. The pneumatic control valves use common addressing to assist in locating and trouble shooting problems with an associated valve. The Pneumatic Manifolds in the station are labeled by number PM1, PM 2 etc. The control valves on the manifold are also labeled by number V1, V2, V3, etc. The port of the valve is also labeled S12 (Green) and S14 (Orange). The figure below illustrates Pneumatic Manifold 1 (PM1) with 5 control valves V1-V5 (Bottom to Top). Each valve has two ports S12 (right side) and S14 (left side). The first valve is labeled PM1.V1.S14 and PM1.V1.S12. If a control valve is faulted, it will be displayed on the HMI alarm banner in the same format i.e. PM1.V3.S14 would be Pneumatic Manifold 1, Valve 3, Port S14 (left side of valve). As válvulas de controle pneumático usam de endereçamento comum para auxiliar na localização e solução de problemas com as válvulas associadas com elas. Os coletores pneumáticos na estação são rotulados pelo número PM1, PM 2 etc. As válvulas de controle no coletor também são rotulados por número de V1, V2, V3, etc A porta da válvula é também rotulada S12 (Verde) e S14 (Orange). A figura abaixo ilustra o coletor pneumático 01 (PM1), com 5 válvulas de controle V1-V5 (baixo para cima). Cada válvula tem duas portas S12 (lado direito) e S14 (lado esquerdo). A primeira válvula é rotulada PM1.V1.S14 e PM1.V1.S12. Se uma válvula de controle apresenta falha, ela será exibida no indicador de alarme HMI no mesmo formato, ou seja, PM1.V3.S14 que seria o coletor pneumático 1, Válvula 3, Porta S14 (lado esquerdo da válvula). Há muitos anos, o médium XXXXXX XXXXXXXX, que tem uma enorme quantidade de livros psicografados e dezenas deles publicados, recebeu um pedido dos Mestres da Luz, Guias de Lei e de Umbanda, no qual solicitavam que as informações reveladoras, por eles transmitidas, não fossem apenas para seu bel prazer, e sim para que, por meio dele, o conhecimento se multiplicasse. Com isso, XXXXXX começou a ministrar o curso de Teologia de Umbanda, um curso simples e teórico, visando a uma melhor formação do médium umbandista em relação aos Fundamentos da Umbanda. Many years ago, the medium [name withheld], who has an enormous quantity of books psychographed (inspired by spirits) and dozens of them published, received a request from the Masters of Light, Guides of the Law and of Umbanda, in which they asked that the revelatory information transmitted by them not remain only with him, for his own pleasure, but that, through him, the knowledge be spread. With that, (name withheld) began to administer the course of Theology of Umbanda, a simple and theoretical course, aimed at better development of the medium of Umbanda in relation to the Fundamentals of Umbanda. The second extension well, the 3-BRSA-394-ESS, at 4.8 km from the discovery well and 1.6 km from the 3 - BRSA-353-ESS, to the W/SW of both, found a 520 meter oil column, with the top of the carbonate reservoir at 4600 m (-4575 m) and the base of the reservoir at 5120 m (¬ 5095 m), with no indication of oil/water contact. It showed permo-porous characteristics below those found in two other wells of the region. The first formation test of the open hole in the interval of 4925/5110 m (-4900/-5085m), in the lower carbonate reservoir, found the presence of 38.3° API oil. The second test was the cased hole in the interval of 4622/4644 m, in the upper carbonate reservoir. The results of this test were low productivity due to the faciology of the rock that features fine grain (peloidal packstones), low porosities and very low permeability. Experience Years of translation experience: 15. Registered at ProZ.com: Jan 2010. Became a member: Feb 2011. 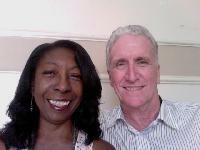 Professional practices Christopher & Rozilene Frye endorses ProZ.com's Professional Guidelines. Christopher Frye, a native speaker of English, has passed courses the courses below at New York University, for a Certificate in English to Portuguese Translation. He has also taken Editing for Translators through The Monterey Institute of International Studies. Working with his wife, Rozilene Frye, a native speaker of Brazilian Portuguese and a published author in Brazil. Christopher has 35 years of experience working in the newspaper printing trade, especially in maintenance and repair, and has a good understanding of mechanics. He also served as a union local vice-president, negotiating contracts and preparing arbitrations. He has done several literary translations, including novels, and textbooks from Brazilian Portuguese to English. Rozilene, who is a psychologist by profession, has years of experience working in the Brazilian medical and court systems.